This is a great double CD-R set from Ralph's performance at Thomas Point Beach Bluegrass Festival, Maine on 6th Sept 1987. It was the first time Ralph had appeared at the festival, which was about 1,000 miles from his home in McClure Va. In the four weeks prior to the show, the band had played festivals in seven US states, probably clocking up at least 5,400 miles and they had their next appearance in Kentucky just four days later. Two sets are included here in their entirety. The afternoon show kicks off with Swinging A Nine Pound Hammer which Ralph didn't record in the studio, quickly followed by the Stanley's classic You're Still To Blame. Curly Ray Cline, Jack Cook, and Junior Blankenship then get to do their individual 'showpiece' numbers, as Ralph works his way through the band introductions; and then Sammy Adkins provides lead vocal for Who's In Your Heart which was on the band's 'current' album, Lonesome And Blue. 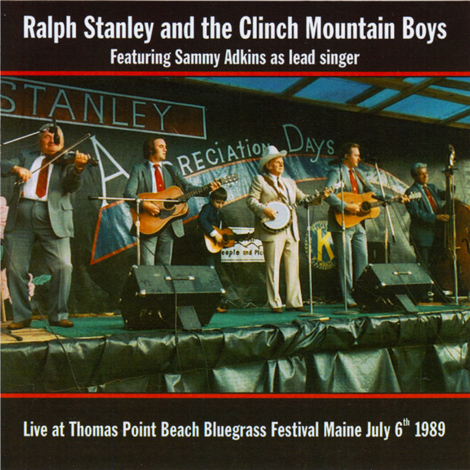 Following on, there's the gospel segment, and another track, Room At The Top Of The Stairs from Lonesome And Blue, before Curly Ray Cline is given his spot to sing a couple of songs. The set then closes with the Stanley Brothers favourite Choo Choo Comin' and a brief encore of Orange Blossom Special. The second set, from their evening performance is largely a 'requests' show, drawn from the Stanley Brothers and Ralph's back catalogue, plus Old Richmond Prison from the latest LP. Ralph and the CMB's are in fine form throughout, with an enthusiastic crowd and I'm sure this release will delight fans. A recording from this festival has previously circulated on the 'net, but the sound quality is I think much better on this release, which has been issued with the blessing of Ralph's estate. Some of the dialogue in between songs and mic-checks have been edited out, presumably to make the show flow better, although it also has more complete song introductions in some cases, than the lo-bit rate version that is on sugarmegs. PS: The first pressing has a couple of typo's, and incorrect show date on the cover... which I'm told will be corrected on future pressings. Donnie Joe Mullins - P.D. - P.D. 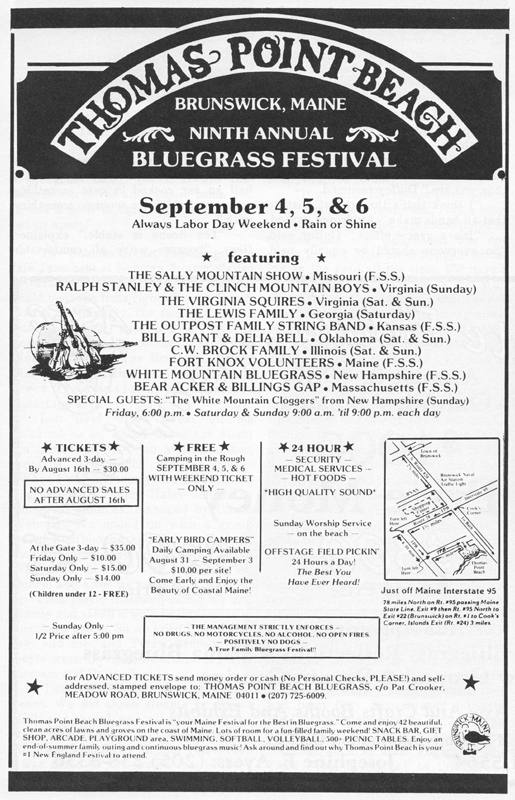 From adverts and festival listings in 'Bluegrass Unlimited' Ralph is advertised at these dates:- 7-8th Aug, North Central Ohio BGF, Coonhunters Club, Plymouth East Rd, Greenwich, Ohio; 13-15th Aug, Hazard BGF, Jacklot Hollow, Hazard, Kentucky; 20-22nd Aug, 7th Annual E&W Production, Petersburg, Michigan; and 21-23rd Aug Jack Lynch's BGF & Movie Filming, Arcanum, Ohio; 29th Aug, Waterloo Bluegrass Concert, Waterloo, New Jersey; 3rd-6th Sep, Southwest Virginia Music Festival, Lebanon / Tazewell, Virginia; 5th Sep, Delaware BGF, Gloryland Park, Glasgow, Delaware; 6th Sep, 9th Annual BGF Thomas Point Beach, Brunswick, Maine; 10-12th Sep, 13th Annual Meadowgreen Park BGF, Clay City, Kentucky. NB: on some weekends, the band would be playing a single day on more than one festival, but it's not always possible to determine which, unless mentioned in the advert. 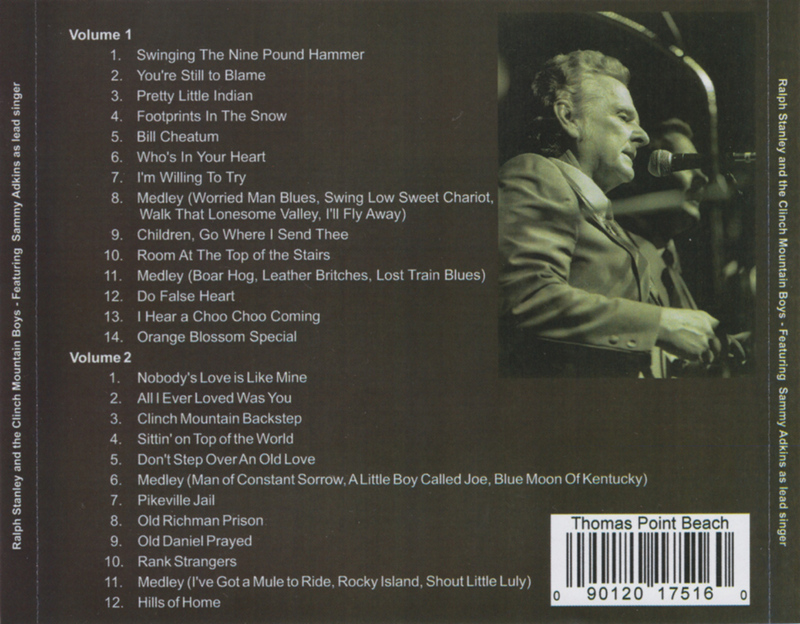 there is a live version of Swinging A Nine Pound Hammer on his 1983 Live At The Old Homeplace LP. 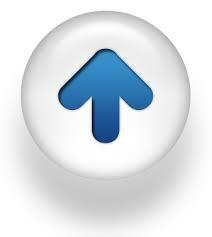 Sugarmegs has a 160 kbps version of the show which is available as WMA and MP3. The main differences are that dialog has been cut on the CD-R after Pretty Little Indian where Ralph mistakenly calls the tune Bill Cheatum saying "I wrote it when I was thirteen years old and Curly's recorded it, and he does a good job I think" and then later on after Junior has played Bill Cheatum Ralph realises that he introduced Pretty Little Indian incorrectly and apologises saying: "Well I'm sorry that was 'Pretty Little Indian', yeah. Sometimes you know you forget folks and tonight that's what's happened to me. I'm a getting so forgetful. The other day I got worried about it and I went to the Dr. And I said 'Doc I can't remember a thing anymore'.... He said 'How long have you been that way?'... I said 'What way?'". The other major edit is during the sales pitch that follows Room At The Top Of The Stairs where Ralph plugs an upcomming gig at the University Of Maine, in Orono on 6th Feb 1988 with Ralph and Bill Monroe on the bill. Other minor edits include the removal of Ralph saying "We've got time to do a little bit of one more and folks I believe we'll see you again tonight around 8:30. Anyone that has a special request, if we know it we'll be proud to do it for you." at the end of Adieu False Heart. Towards the end of the second set, Ralph comments about a planned festival finale with several bands on stage, which didn't come into fruition, so at the end of Old Daniel Prayed Ralph says "Thank you, thank you folks, thank you very much. It's getting late (and) everybody is getting cold and we've a long ways to go. I guess we're going to have a jam session on at the end. Rank Stranger? Ok we'll do that and while, if we're doing that, if all of the bands will get ready to come up on stage, after that and we'll so another number or two while everbody is getting ready or something"; and then at the end of Rank Stranger - "Well I guess we're hardly not ready so I'll do a little bit of clawhammer. This cold air sometimes just knocks the groundhog hide out of tune like Curly Ray...". Mic tests at the beginning of each set are also cut. 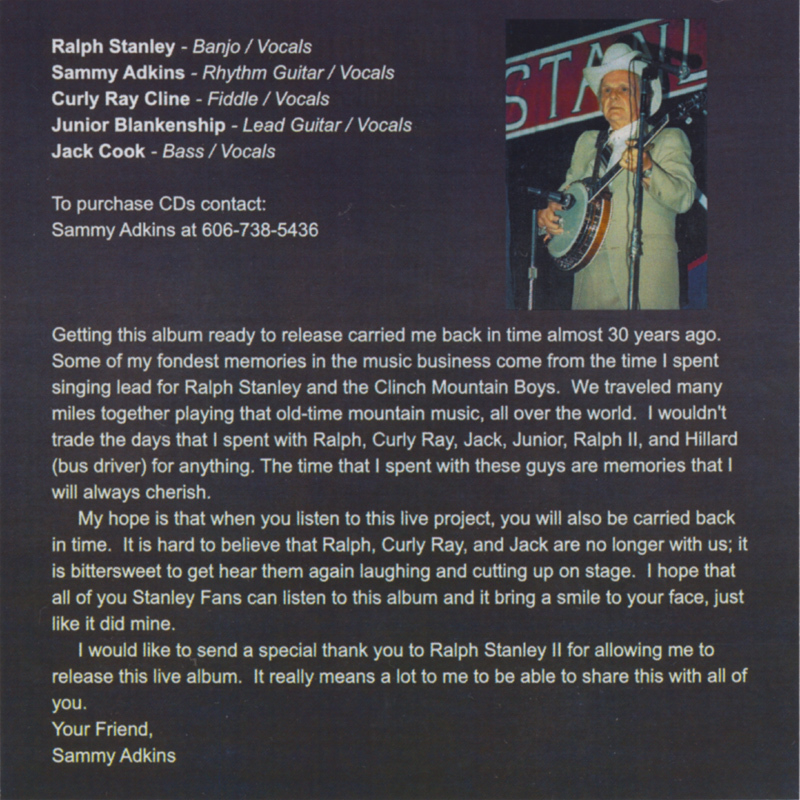 The 2xCD-R set also includes some lengthier introductions than featured in the Suarmegs recording, with Jack Cook and Sammy Adkins getting mentioned by name and the songs Children, Go Where I Send Thee, Clinch Mountain Backstep, Sittin' On Top Of The World, Old Richmond Prison, Old Daniel Prayed and Hills Of Home all having their titles mentioned in Ralph's introductions.